Add about 1cm of milk to the bottom of your bowl. 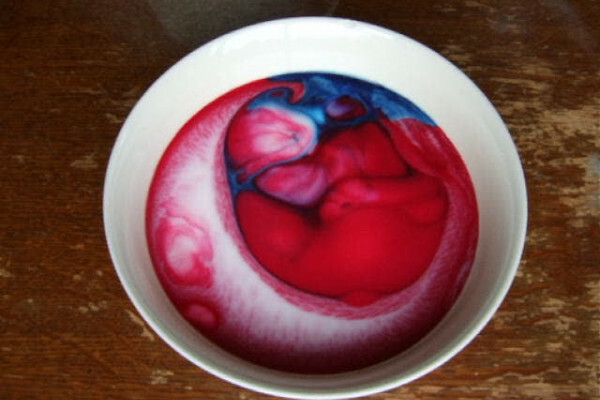 Pour a few drops of each colour of food colouring onto different places on the surface of the milk. Add a drop of washing up liquid somewhere in the bowl. After a minute or so and everything has stopped moving, add another somewhere else. You should find that at first the food colouring moves away from where you added the washing up liquid, and then it starts welling up from below the surface of the milk, forming beautiful patterns. Here is a video of the effect speeded up by a factor of 25. Milk is mostly water, and water has a property called surface tension, this is because all the water molecules are strongly attracted to other water molecules, but not to air, so they try to get away from the surface of the drop, making the surface as small as possible, this is why raindrops are approximately spherical - the shape with the least surface for its volume. This means that the surface of water, or milk, is always trying to shrink. The surface of the milk is always trying to shrink, due to surface tension. The food colouring is less dense than the milk so it floats on the surface. Something else you may have noticed is that the food colouring seems to float on the surface of the milk, this is because the milk has lots of substances dissolved in it such as Calcium making it more dense than the food colouring which is almost entirely water. Washing up liquid is designed to break up the surface tension so water can dissolve fats and grease. This means that where you add the washing up liquid the surface tension is much weaker than everywhere else, so this surface gets hugely stretched by the milk which hasn't met the washing up liquid yet. The washing up liquid breaks the surface tension where it lands, allowing this surface to stretch hugely, causing the rest of the surface to shrink hugely. This shrinkage pushes the food colouring downwards, and it floats up again forming beautiful patterns. Because the rest of the surface is shrinking it must be getting thicker, this pushes the food colouring downwards, and there is a current below the surface flowing back towards the washing up liquid pulling the food colouring along. It then floats back up to the surface producing beautiful patterns. Why does washing up liquid reduce surface tension? A washing up liquid molecule is made up of a water loving head and a water hating tail, so when you add it to water the molecules arrange themselves over the surface - head inwards. The water is strongly attracted to the heads of these molecules, so is now stops trying to reduce its surface area, and the surface tension is far weaker. Does the music at Sea World bother the whales?